In the early 1990s, Michael Franti led the influential and provocative band The Disposable Heroes of Hiphoprisy. The band was political, sometimes angry and the furthest thing from being a hit-maker. But in 2009, Franti did in fact score a hit with a song called "Say Hey." It reached the Billboard Top 20. Though his sound may have changed, his message hasn't. His latest album is called The Sound of Sunshine, but it still deals with issues that he's passionate about: social justice, the environment and peace in the Middle East. "I think my soul is intact, but my methods of reaching people are completely different," says Franti in an interview with Weekend All Things Considered host Guy Raz. "When I first started out, I thought it was enough to make an angry song that pointed out the problems of the world." Franti says that once he ventured out into the world and saw how his music affected his audience, his outlook on making music changed. 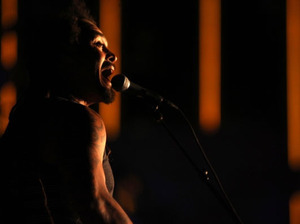 "Playing on the streets of Iraq, or in Israel or the Gaza strip, I'd sing angry protest songs against war," says Franti. "People would say, 'Make us clap, make us dance, and laugh and sing.' It really made me think about the importance of happy music." The Sound of Sunshine was actually recorded after a very serious health scare. "I was out with the Counting Crows and I had this abdominal pain. I felt this pop in my abdomen," says Franti. "My appendix had ruptured." The time that Franti spent in the hospital inspired the sound on this album. "Every day in the hospital, I'd go over to the window and I'd pull back the curtain to see if the sun was shining, and if it was, I'd get this feeling like, 'Yes, I'm gonna be better today," says Franti. "I wanted to bottle that feeling for people, because right now is a really difficult time in our country and in the world. There are so many things to be worried about, and I wanted to make a record that people could put on, and it would lift them up the way the sun did for me each day."